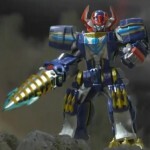 Super Megaforce Mega Bloks Q-Rex Megazord, Ultimate Legendary Megazord & more! A few days back we reported some of the first information regarding the Mega Bloks Super Megaforce Q Rex Megazord, info that came via an Amazon listing. 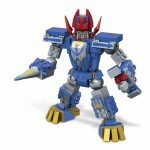 Now the Mega Bloks website has listed this set with full images and a back story for the Megazord itself! The site has since updated with images of several other upcoming sets including the Legendary Megazord, Ultimate Legendary Megazord, and Air Gliders for the Red Blue & Green Super Mega Rangers as well as a glider for the villain Bruisers/X-Borgs. The ever helpful Raz has compiled a list of these sets as well as their retail prices after the jump.